I promised on D’Vine Health’s Facebook Page that I would try to post previously shared recipes here so they would be easy to find and reference when needed. And so I am! 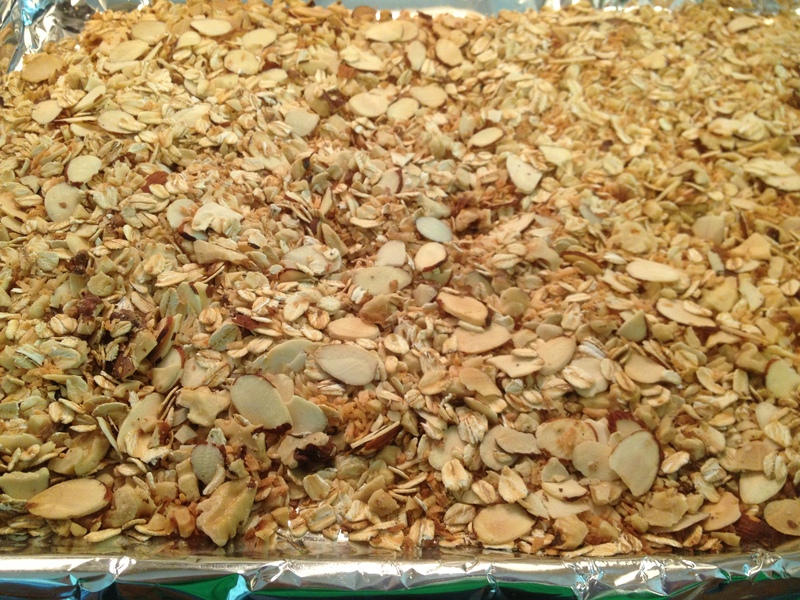 I am so excited to share these with you because after several years, probably decades, of searching, I have found a granola bar recipe that is not only nutritious, easy to make and absolutely delicious, but inspired my husband to say,”You don’t need to buy granola bars anymore, just make these” (!!!). Now, it does this girl’s heart good to know that super nutritious snack food doesn’t have to be “bland crap” (long story that I’m sure I’ll share later) and that our families even prefer them over store bought counterparts. Yippee!! 1. Preheat the oven to 350 degrees. 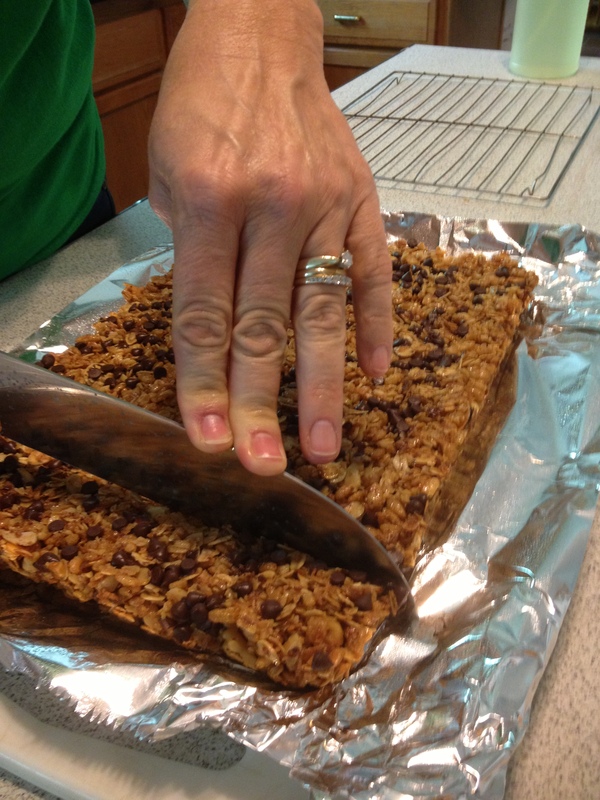 Prepare a 9 X 13 baking pan by lining it with heavy duty aluminum foil and spray with non-stick spray. 2. 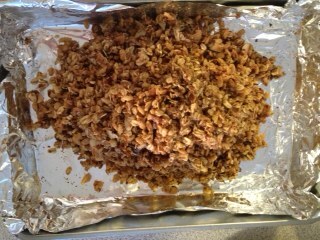 On a baking sheet, spread the oats, walnuts and almonds. Place on center rack in the oven for 7 minutes. Add coconut and stir to combine, then place back in the oven to cook for about 6 more minutes. Remove from oven and turn temperature to 300. 3. While the oats, nuts and coconut are toasting, combine the honey, brown sugar, coconut oil, vanilla extract and salt in a small saucepan and place over medium heat. 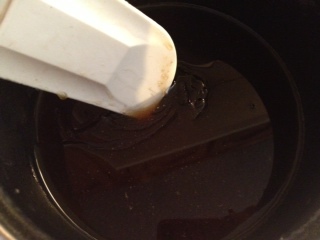 Stir until the sugar is completely dissolved. Turn off heat and set aside. 4. 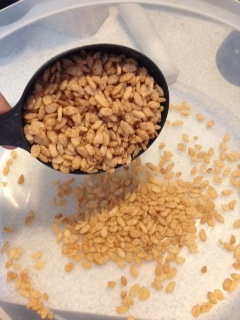 Add rice cereal to large bowl, then add the nut and oat mixture. 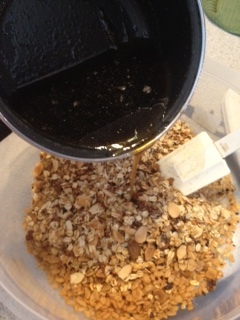 Drizzle honey mixture over all and mix until all dry ingredients are moistened. 5. 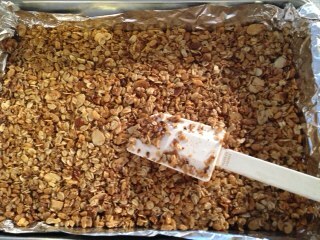 Pour mixture into prepared, lined baking pan. Spread it evenly and press mixture lightly into corners and edges, being careful not to pack it too hard. 6. 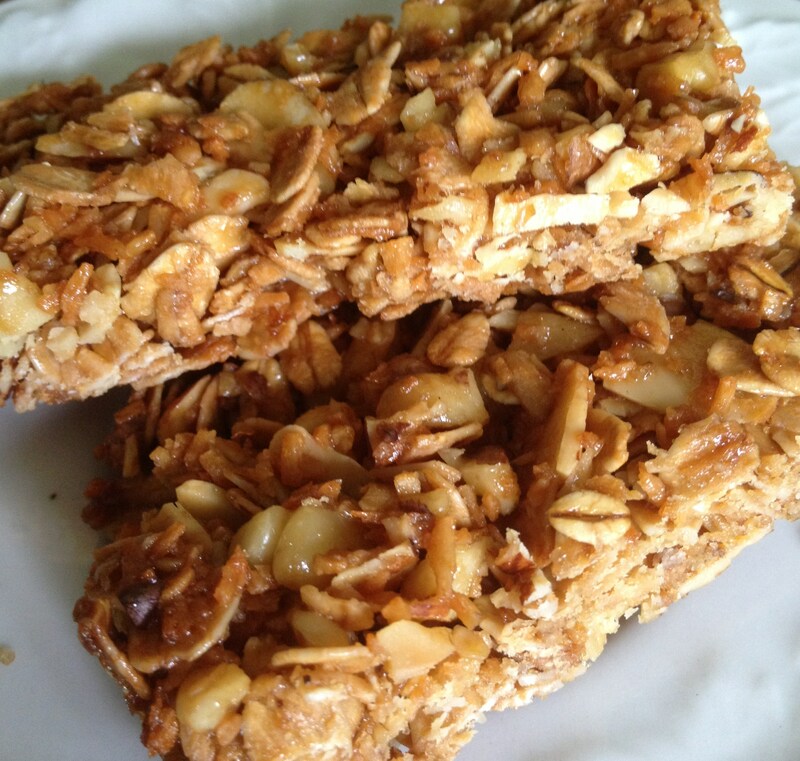 For a crunchy, chewy bar bake in 300 degree oven for 13-15 minutes, a little longer if you want them crunchier, but not more than 20 minutes. Remove from oven and allow to cool for 30 minutes. Using foil edges to remove bars from pan, transfer to a cooling rack to cool for an additional 30 minutes. Finally, transfer foil to a cutting board and cut bars into desired size and shape with a large butcher knife. 7. Store in a single layer in an airtight container for up to a week, or package in snack size zip bags for easy on-the-go breakfasts or snacks. 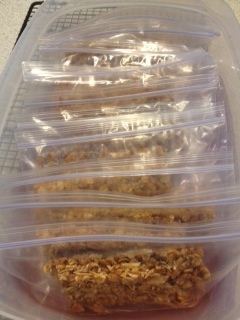 Optional: Cut and store bars in bite size pieces to grab and go for toddlers and preschoolers. 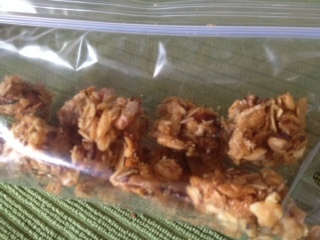 I just have to send thanks and hugs to my friend Candace at www.sacredmommyhood.com for turning me on to this recipe. I’ve just made a few changes to fit my nutrition preferences. That’s it! You can find the original recipe here. Please let me know if you try them or if you have any questions!